Hard to believe that Thanksgiving is almost here again, even though I type this on Fall Back Sunday with the sun sinking low behind the orange leaves on the trees outside. I am struck by how different this year has been for us with Garrett in Kindergarten at a public school. For four years he attended a sweet little church preschool where they were constantly having events to celebrate the seasons. This year it’s different. There are not any school parties or trunk-or-treats. There is not going to be a Thanksgiving program where all the kids line up in their fringed vests made from brown paper sacks and sing the “Hello Mr. Turkey, How are You” song. 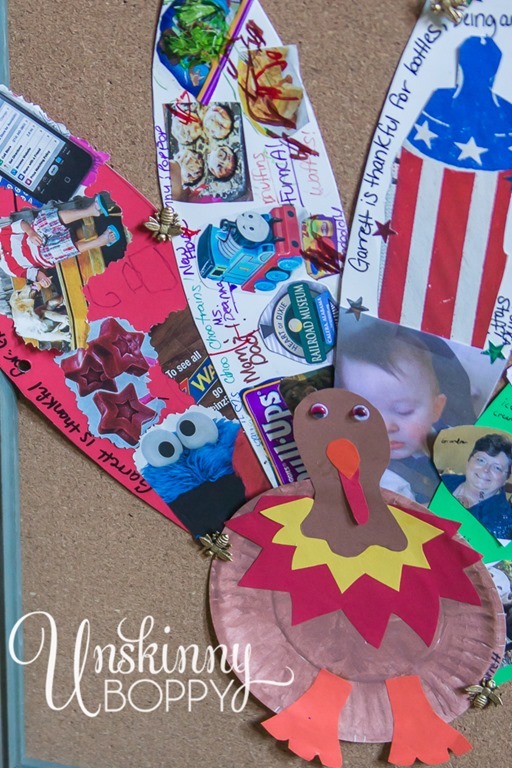 Every year at the preschool we were asked to decorate a feather with all of the things that Garrett was thankful for that year. I have feathers from every year starting when he was a little baby in 2008 until last year. I realized that this year there won’t be a feather from school to carry on that tradition, which makes me very sad! 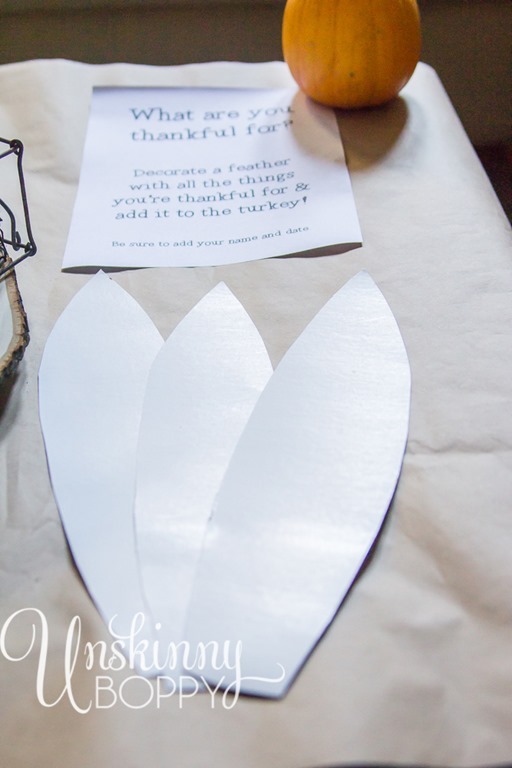 So, instead of moping around, I decided to continue the Thanksgiving turkey feather tradition at home. 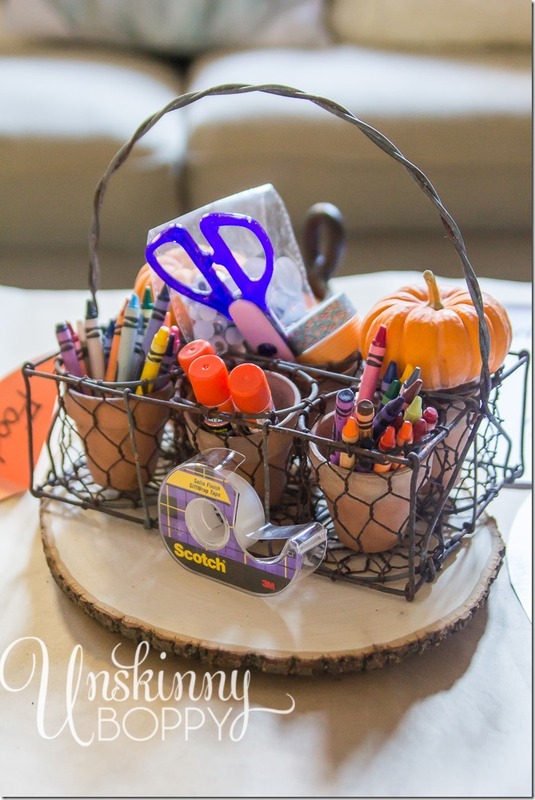 If you are going to be hosting Thanksgiving at your house this year, it’s pretty easy to set up a craft table in the middle of the living room for the kids. This keeps them out of the way while the adults are working in the kitchen and dining room preparing the food and setting the table. Turn on the Thanksgiving Day Parade on tv and let them go crazy making their very own Thankful feathers. I gathered supplies for making the feathers, including a basket full of crayons, glue sticks, kid-friendly scissors, wiggly eyeballs, washi tape, and regular tape. Depending on the age of the kids who will be attending, you might assign an older child to be in charge of some of the younger ones who need help with scissors. 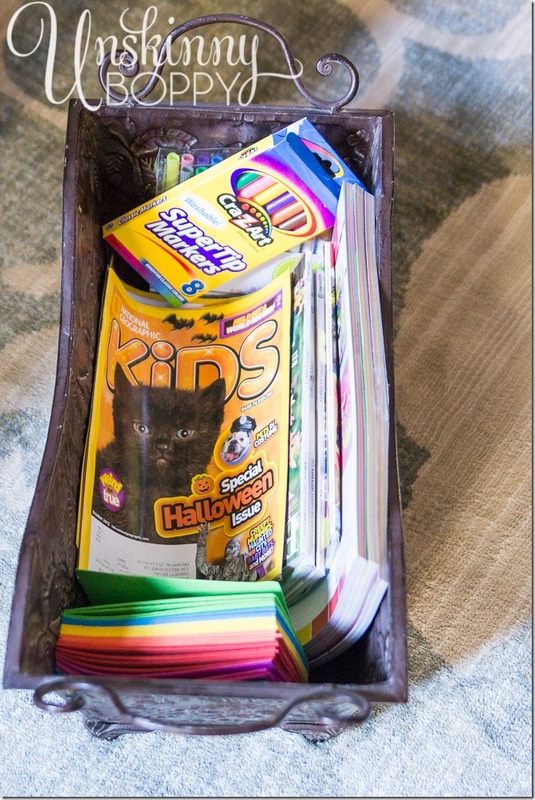 Under the table I assembled a bucket of old magazines, scrapbooking paper, markers and foam craft squares. Let the kids go through the magazines and cut out pictures of their favorite items that they are thankful for, or ask them to draw a picture of it. You could also provide some photographs of family members and pets. Hopefully the kids are thankful for those folks to include on their feathers! 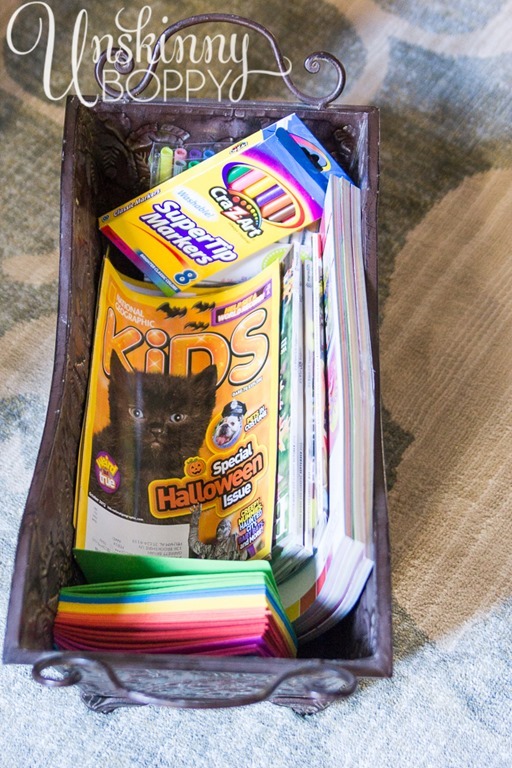 I like to cover the coffee table with kraft or butcher paper to catch any big messes. I printed out these quick instructions on my printer, but you could write it in marker directly on the paper. 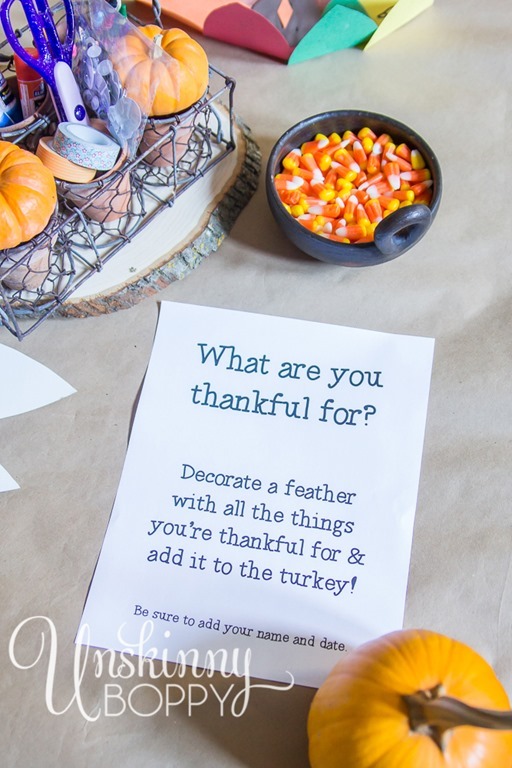 A bowl of candy corn is optional, depending on how hyped up you want the kids to be while you are saying grace and sitting down to a meal together. 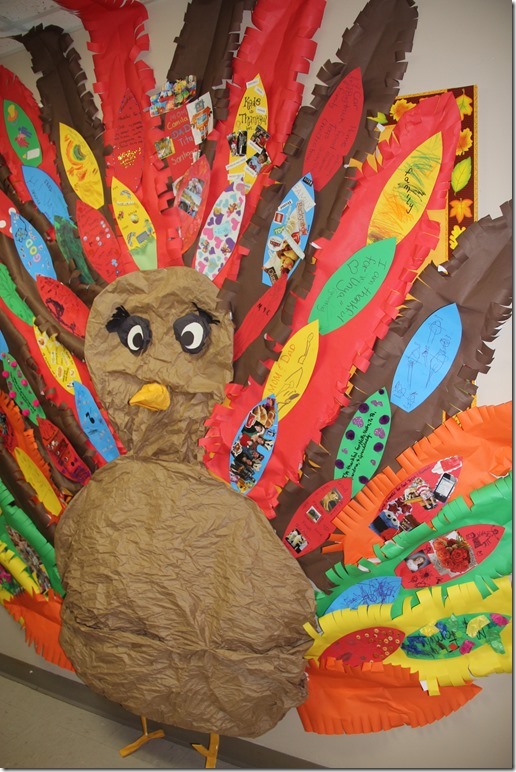 Get a headcount of the number of kids that you’ll have in attendance, and precut the feathers from poster board. I actually didn’t have any poster board on hand so I used the top of an old clothing gift box instead. Same thickness, works great. You just want the feather to have some strength to hold up over time since you will be pulling these out year after year. Let the kids do whatever they want with their feathers. It will be much more interesting to look back in a few years and read that your kid was Thankful for iPhones and popsicles than something boring like mom and dad. If there is a baby around, feel free to get creative and be thankful for Drop-in bottles and Pullups. There are no rules here. Just keep it fun, honest and real. 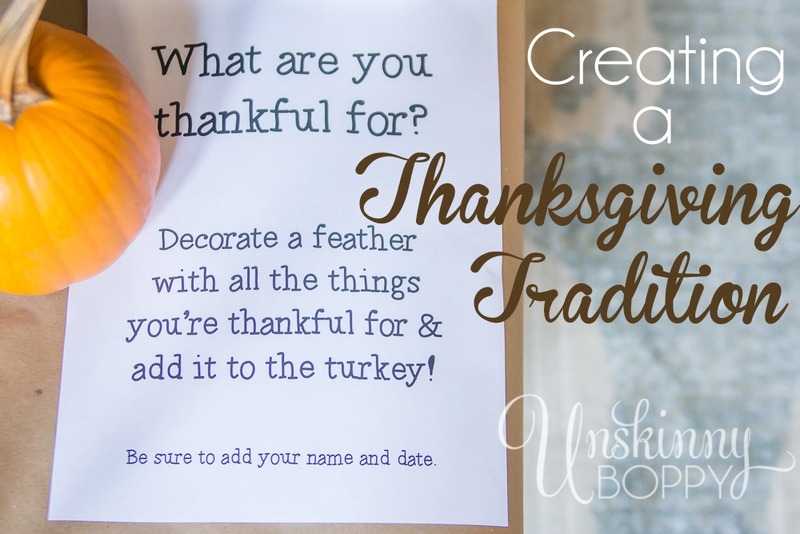 Once all of the feathers are crafted, have the kids add them to the turkey, which is just a paper plate that has been painted brown with construction paper anatomy. Be sure to keep all the feathers in a very safe place that you can remember (send yourself an email reminder telling where you stashed them!) so that you can pull them out year after year and watch your kids feathers grow. After a few years, you’ll have a collection of feathers to fill a bulletin board. If you have an extra large family, after a few years you might need to dedicate an entire wall for the turkey feathers! Dream big, my friends. A fun tradition like this is worth the wall space. 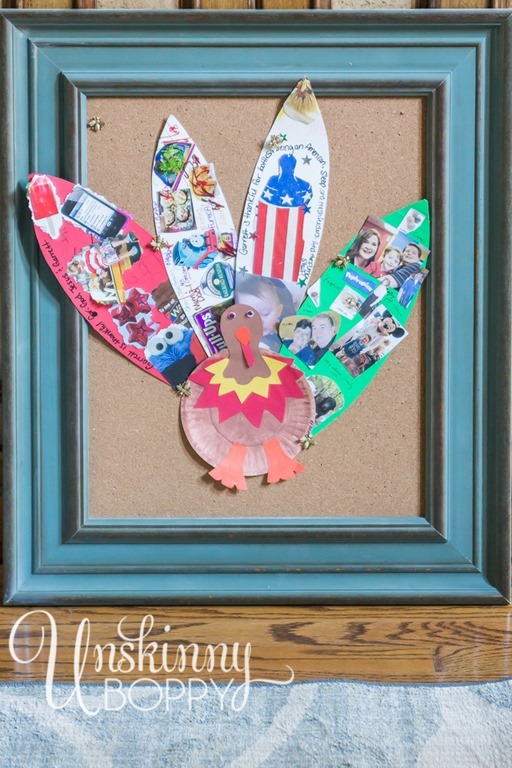 No matter the size of your family, it’s well worth setting a kid’s craft table for Thanksgiving to start this fun tradition. 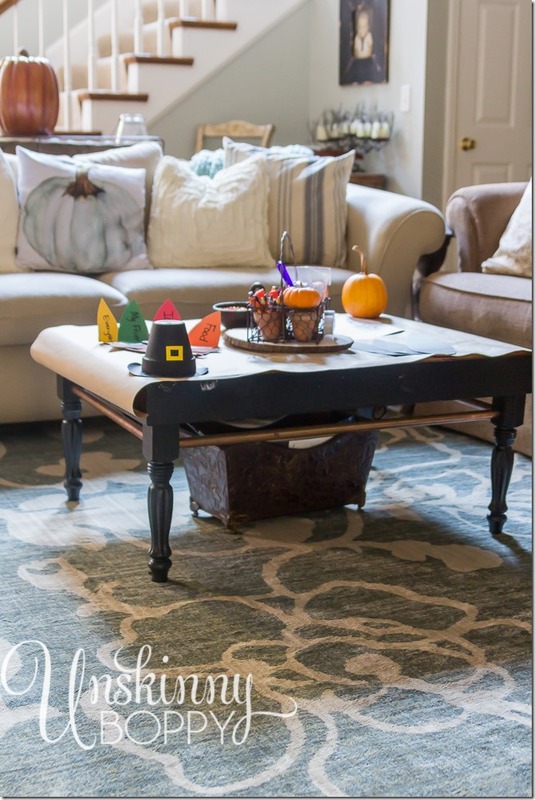 One of my incredible sponsors, Mohawk Home, wants to help you set your Thanksgiving table this year by giving away a GORGEOUS rug from their American Rug Craftsman collection. 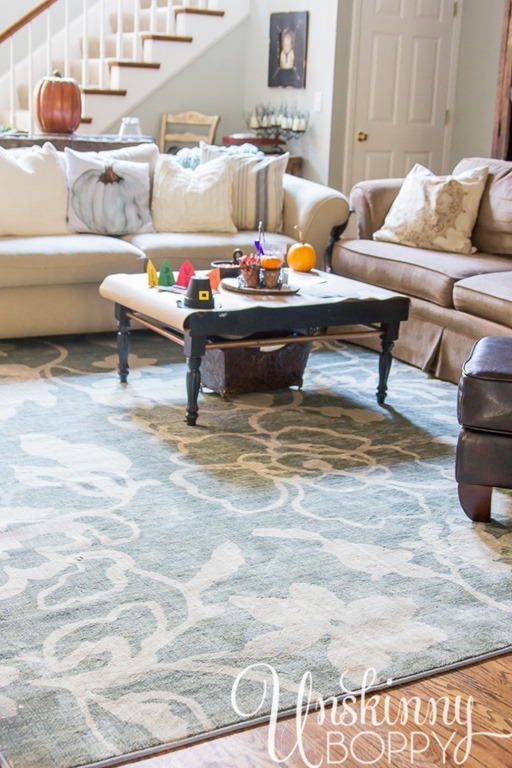 This beautiful new rug in my living room was provided by Mohawk from the new collection. I just love it! It’s super soft underfoot, and soft blue/green/beige color palette is perfect in my laid back home. All you have to do to have a chance to win a rug is click here and enter the Mohawk Home Set the Table Holiday Giveaway. Follow the steps on the facebook page for your chance to win an American Rug Craftsman rug of your choice, up to a $1,000 retail value! Remember to use the hashtags #setthetable and #mohawkhome in your Pin-to-Win entries! 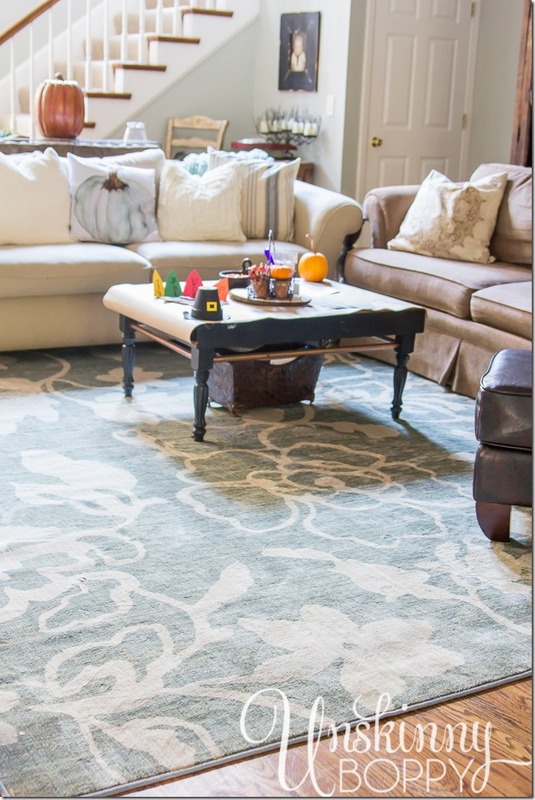 Ok, head on over and get those entries started to win a beautiful new rug from Mohawk. I’m going to go help Garrett cut out pictures for his feather creation this year. 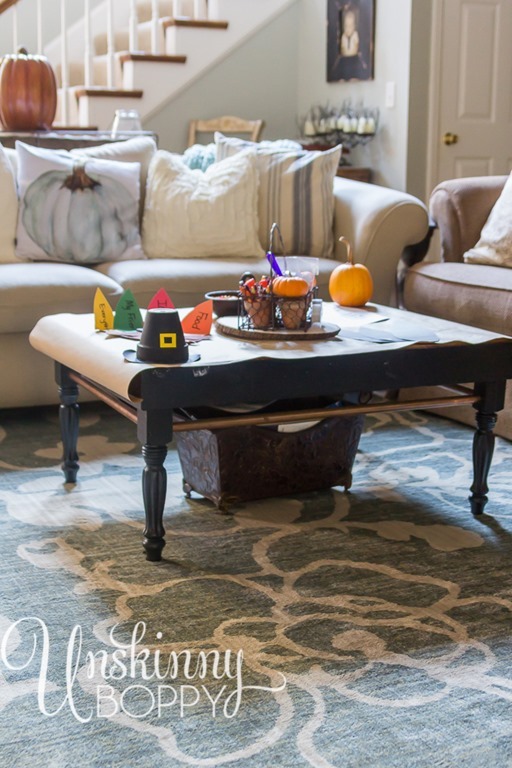 Mohawk provided me with a free American Rug Craftsman rug in exchange for this fun blog post about creating Thanksgiving Traditions, but as per usual, all opinions about products are my own. I’d love to enter the contest (I have a spot in dire need of a rug!) but the link is missing to enter the contest. I tried searching on Facebook but couldn’t find it that way either. Thanks! What a great idea, Beth! I am very big on traditions – and I might do this with my own kids. Thanks! Thanks Breida! This is a fun (and easy) one! I love your tradition! Now that my boys are older, it is so important to reinforce being grateful and thankful for the big and the little things! You are a great momma! What a precious Thanksgiving tradition! super cute idea and great pix!